IT’S safe to say that Malaysians grew up with stories about wayang kulit. If anything, our history textbooks taught us how this heritage is one of our region’s prides and joys. And how before the advent of movies, radio and television, our ancestors enjoyed wayang kulit performed by masters of the art ­— telling tales of mystery and wonder, epics from India and legends from the Malay Archipelago. While to the general population, wayang kulit is a lost art — something that lives only in memories — founder of the Masakini Theatre Company, Sabera Shaik, finds wayang kulit a passion that is alive and thriving. 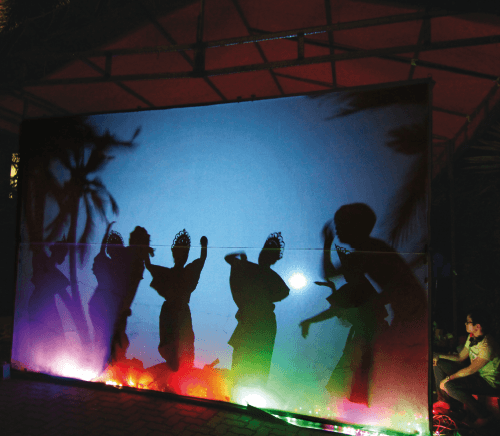 In 2011, Sabera created the first shadow theatre performance in Malaysia—Wayang— and it premiered to critical acclaim. 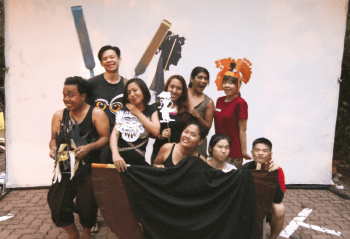 More than three years on, the Masakini Theatre Company has now finished the production of its third shadow theatre production, called Wayang — Malaysian Stories. These productions do not feature just wayang kulit, but are an amalgamation of handmade puppets, light refractions, and projections. With the help of some talented dancers and actors, Sabera creates some truly stunning images behind a pure white screen, which is no easy feat. Putting together a masterpiece consisting of nothing but lights and shadows is a skill she learned from attending a workshop by shadow master Norbert Gotz in Bamberg, Germany in 2011. 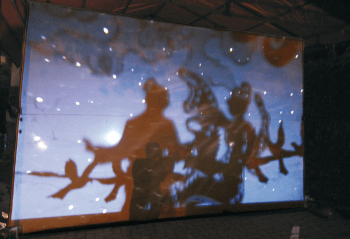 “It is unfortunate that the general public does not know much about shadow theatre or wayang kulit anymore,” Sabera shares with The Edge Financial Daily. Wayang — Malaysian Stories, Sabera says, is really a result of not only her ideas but also from input given by the rest of the team: the actors. “The inspiration really came from all the actors; I can’t take credit for all of it. The story evolved — at first, we wanted to do personal stories but that didn’t seem too interesting; not something that the audience would be able to say ‘Wow!’ to. So we decided to look at bedtime stories, and we had a Malay-Chinese-Indian mix in the cast who had different ideas for stories. “It didn’t matter that finally our stories were legends… And it all came together without us really planning it. One story is about the sea (Ulek Mayang), one about the earth (Narasimha) and another about the heavens (Legend of Qixi),” she added. The art of shadow theatre is not as simple as it seems. It involves coordination, steady hands, and a variety of lighting that can best portray and depict each scene perfectly. “It takes some time for actors to practise to have steady hands and steady bodies. The actors have to keep in mind what they look like on the other side of the screen. “For instance, when they are wearing the 3D masks, they have to have their heads tilted to one side in order to show the masks properly. In addition, there is also the question of where they have to stand on the stage — if you’re closer to the light, you appear bigger, and when you’re further, you appear smaller,” Sabera said. All these involve a tonne of hard work on the part of the actors and the director. Markers called “roadmaps” are drawn on the stage so that the actors know exactly where to stand during each scene, and obviously, everything is rehearsed down to minute details. The actors have to be very precise with their actions — no more, no less than what has been directed, because any deviation can cause the story to change in subtle ways. Sabera’s idea for her next project—another wayang—is pretty revolutionary. The plan is to use moveable screens so that the audience can see different things happening on different screens. However, it will be expensive and complicated as there will be the need for rails on the floor. There’ll also be the need for even more coordination so that what’s projected on all the screens complement one another. “The only problem is that I don’t think enough people know about these wayang techniques. You can add shadow elements into regular theatre performances as part of the play,” Sabera lamented. One very interesting thought that has crossed Sabera’s mind is the use of shadow theatre in everyday lives — to even make a living out of it. For instance, someone who’s well versed in the art of wayang could hold small shows during gatherings, parties and events. Basically, wayang kulit as we know it in its traditional sense has come such a long way from its roots in Indonesia hundreds of years ago. Today, it’s a fusion of various art forms: dance, acting, and obviously, the traditional hand-made puppets. Wayang kulit is no longer confined to a plain white screen lit by oil lamps starring puppets on a stick — it has evolved into something much more interesting and exciting, yet still retaining its power to enchant audiences.